The goal of this study is to identify the synaptic interaction between the neurons of the modules kernel, to build a better model of the swimmeret system and to elaborate the neural properties and synaptic organization of neuronal networks. 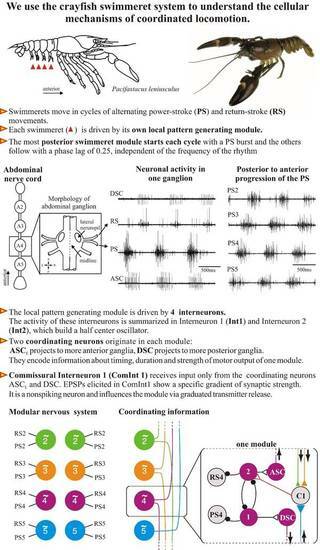 With this information we gain a better understanding of the synchronization of coupled oscillators. Many fields of neuroscience research focus on the dynamics of neural circuits. Despite the number of neuroscientists working in this field the cellular basis of these neuronal circuits has not yet been analyzed in detail. Mostly because the model system they are using are not well suited for this part of the investigation. I am using the crayfish abdominal nerve cord, a part of the central nervous system, which is responsible for coordinating movements of limbs. The crayfish swimmeret system is a good model system for studying coordination of segmentally distributed oscillators in vitro. (4) the target neurons that transmit the received information to the kernel of nonspiking interneurons of their home module.